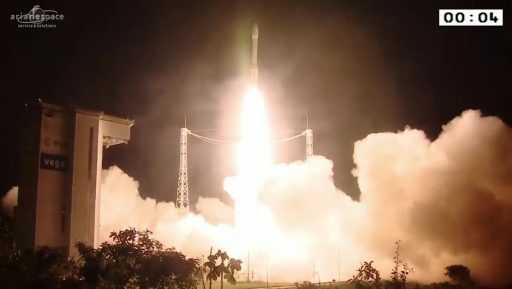 Vega lifted off from the equatorial launch base at 10:43 p.m. local time on Thursday, 1:43 UTC on Friday and successfully fired its three solid-fueled rocket stages before handing off to the liquid-fueled AVUM rocket module for a complex orbital ballet. The multi-orbit mission first steered into an orbit 500 Kilometers in altitude for the release of the four 110-Kilogram SkySat spacecraft 40 minutes after launch ahead of another pair of burns performed by AVUM to lift the orbit close to 700 Kilometers from where the 430-Kilogram PeruSat-1 is going to operate. Mission success was confirmed at 3:26 UTC when all five passengers has been sent on their way. 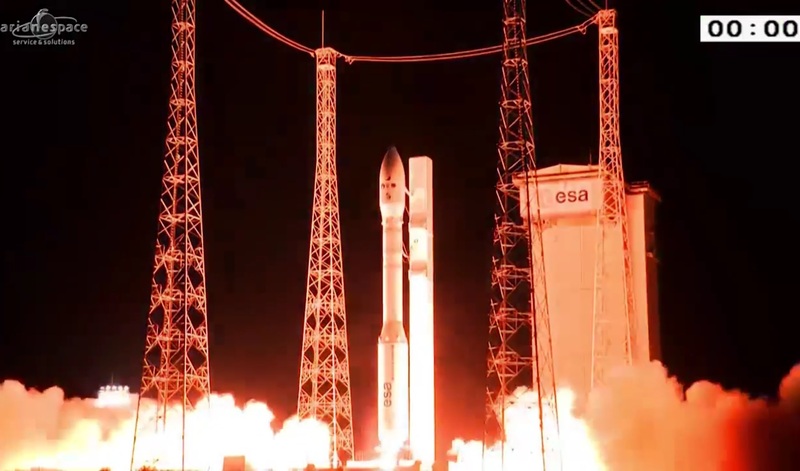 Thursday night’s mission marked the seventh launch of Vega, the light-lifter in the launcher family operated from the Guiana Space Center, accompanied by the ‘Europeanized’ Soyuz and the heavy-lift workhorse Ariane 5. 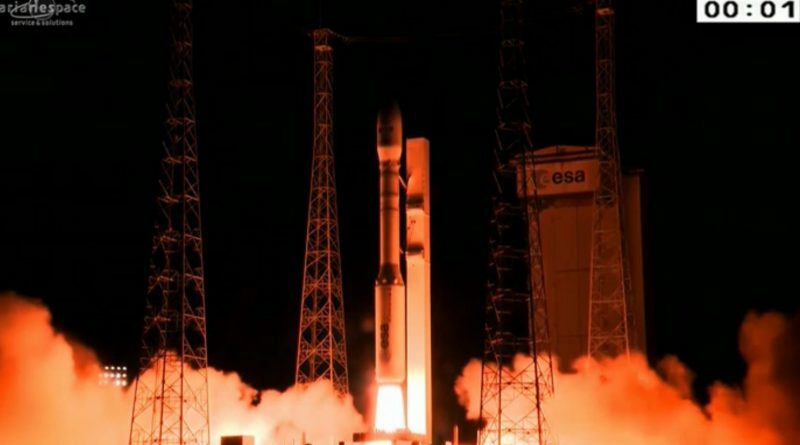 Vega made its first mission in 2012 after almost 15 years of development to offer a launch vehicle to cater to payloads in the lower weight class up to 2,500 Kilograms. Vega was designed with simplicity in mind, avoiding overly complex systems by having all three lower stages be solid-fueled and adding a liquid-fueled upper module to be able to support multi-orbit missions. 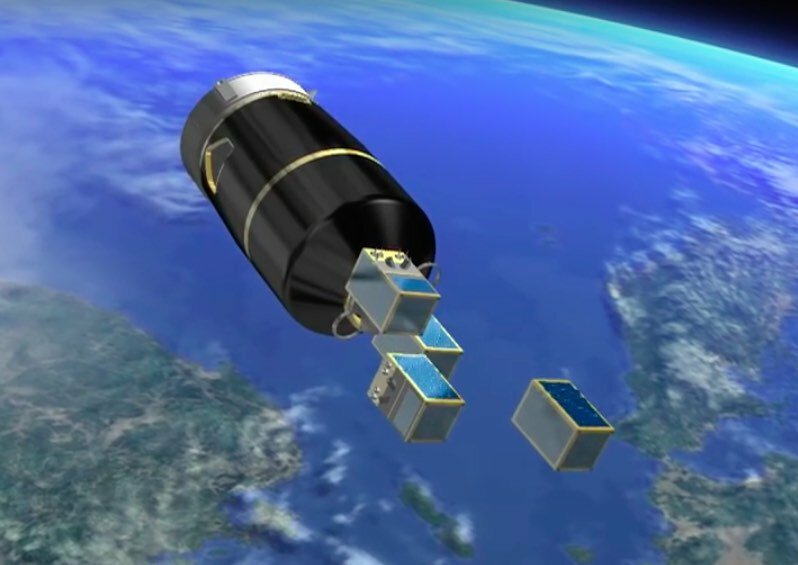 The VV07 mission took advantage of Vega’s multi-orbit capability – hosting payloads that aimed for two different Sun-Synchronous Orbits per the requirements of their Earth-imaging payloads. 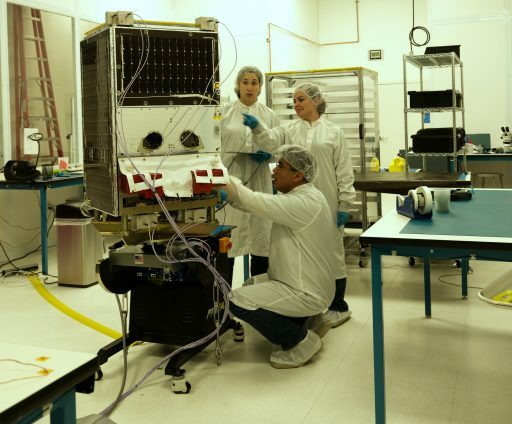 PeruSat-1 is the first Peruvian Earth Observation Satellite ordered by the government from Airbus Defence and Space in 2014. Utilizing a new production approach for small satellites, the design, manufacture and testing of the satellite and its payload was accomplished in less than 24 months. It is the first spacecraft based on the AstroBus-300 platform, part of a family of satellites covering a wide range of weight-classes from 120kg microsats to heavy Earth observation satellites of four metric tons. PeruSat-1 carries a variation of the NAOMI imaging system already flown on a number of missions – a 65-centimeter telescope coupled with a multispectral detector to generate imagery at a resolution of 0.7 meters in the black-and-white panchromatic band and two meters for color/infrared imagery. High-resolution imagery of Peru and surrounding areas will come to use in a number of applications including urban planning, agriculture and disaster management as well as border control and the fight against drug trafficking in South America. The launch contract between Peru and Arianespace was signed in March 2015 and the satellite’s target orbit matched well with Terra Bella’s SkySat spacecraft, allowing them to be placed on the same rocket. PeruSat-1, the larger of the passengers used a standard payload adapter and was hidden underneath the VESPA – Vega Secondary Payload Adapter atop which the four SkySat spacecraft were riding into orbit. Terra Bella, a subsidiary of Google, is currently starting the deployment of its operational Earth-imaging constellation comprised of at least 19 satellites in four orbital planes to allow for quick-tasking and rapid revisit times for the collection of still images and video offered on the commercial market. The company, formerly named Skybox Imaging, launched a pair of prototype satellites on Russian rockets in 2013 and ’14 to provide validation of the satellite payload’s design ahead of placing the order for the second generation spacecraft. While the prototypes were manufactured in-house, the Gen2 satellites are produced by Space Systems/Loral, hosting a powerful imaging system and a propulsion system for orbit and constellation maintenance. The 3.6-meter focal length telescope feeds a CMOS pixel detector capturing panchromatic imagery at a ground resolution of 0.9 meters and color/near infrared images at 2 meters. 30-frame per second video can be collected at a 1.1-meter resolution with the satellite slewing to compensate for its orbital motion to stay on a target for up to 90 seconds. 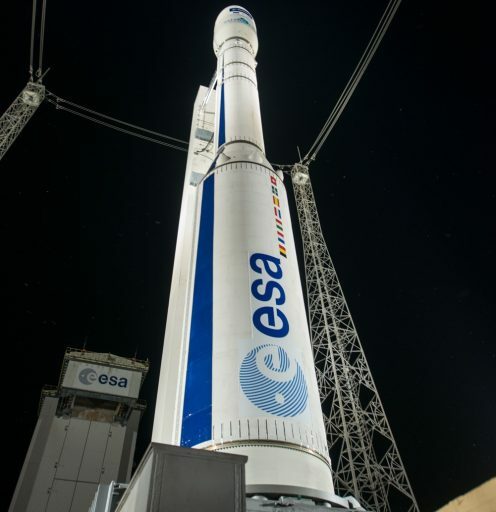 Vega headed into countdown operations in the afternoon hours at the Guiana Space Center, beginning with the activation of the subsystems of the 29-meter tall rocket for a detailed series of checkouts. With a favorable weather forecast, teams rolled back the Mobile Service Gantry three hours prior to the instantaneous launch opportunity to set up for a second round of systems checks and the evacuation of the launch zone. Using three solid-fueled stages and an upper module loaded with storable propellants, the 137-metric ton Vega does not require any dynamic countdown events like propellant loading. Receiving its flight software, Vega was configured for its final countdown sequence by T-34 minutes, allowing teams to complete final polling after the payloads had switched to battery power. Ticking down from T-4 minutes, the Automated Countdown Sequence put Vega through the last steps before ignition, notably the transfer to internal power, a check of the guidance system and the handoff to the rocket’s flight computers. 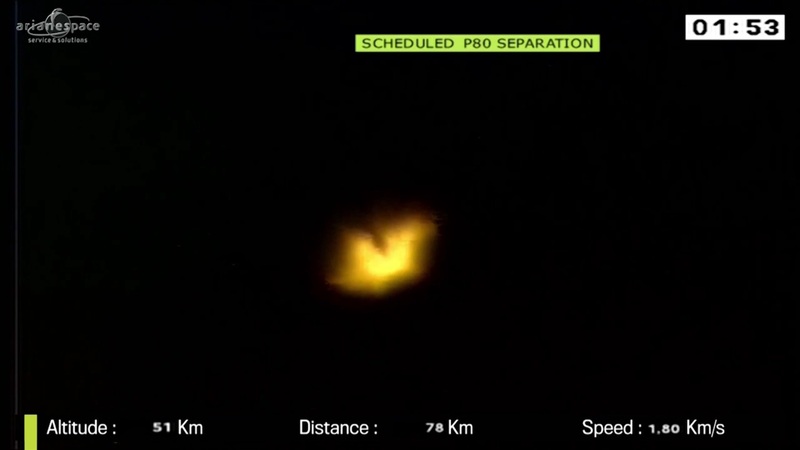 Ignition of the powerful P80 first stage occurred at 1:43:35 UTC and Vega raced off on its journey, clearing the four lightning towers within seconds as it lit up the night at the Guiana Space Center. Only a few seconds after liftoff, Vega began to roll and pitch downrange, setting up a flight path almost due north to reach a polar orbit. P80, generating over 280-metric ton-force of thrust, burned 820 Kilograms of propellant per second to accelerate the rocket to a speed of 1.8 Kilometers per second. Burnout of the 11.2-meter long first stage occurred after one minute and 50 seconds and was followed by the pyrotechnic separation of of the spent stage to enable the second stage to continue powered flight. Zefiro-23 – Vega’s second stage – fired up to a thrust of 122-metric ton-force delivered during a 77-second burn to boost the vehicle’s speed to four Kilometers per second. Once residual thrust on the 8.4-meter long Z23 had tailed off, it dropped away from the rocket 122 Kilometers in altitude, clearing the way for Zefiro 9 ignition right at the T+4-minute mark. Z9 has the longest burn time of the solid rocket stages, soaring to a peak thrust of 32 metric-ton-force generated over 120 seconds to raise the vehicle’s speed to almost match orbital velocity. Just seconds into the operation of the third stage, Vega split open and separated its fairing halves to rid itself of no-longer-needed weight and reveal the payload stack. Burnout of the 4.1-meter long stage was followed by a brief coast phase to allow any thrust to tail off to ensure springs could push the Z9 away from the AVUM stage at T+6:41. AVUM, the Attitude and Vernier Upper Module, assumed control of the flight and was first tasked with lifting the stack from a sub-orbital path into an elliptical Parking Orbit using the 250-Kilogram force MEA (RD-869) engine. 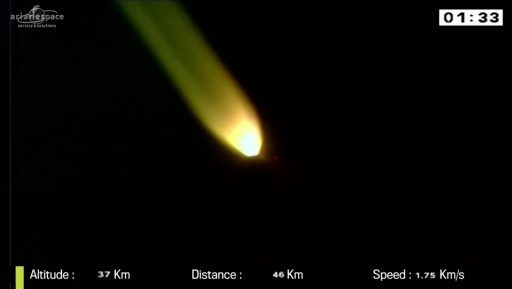 This first and longest burn of the VV07 mission lasted just over six minutes and AVUM dynamically adjusted its flight profile to respond to any insertion errors occurring on the lower three stages. AVUM re-started its main engine after a 24-minute coast, having reached an altitude over 500 Kilometers. The 89-second aimed to put the stack into an orbit of 491 by 508 Kilometers, inclined 97.4 degrees. At T+40 minutes, AVUM commanded a rapid sequence to separate the SkySat satellites within two seconds of each other, pushing them off in a staggered fashion to avoid any inadvertent contact between them as they drift apart and later phase into their respective positions in the growing constellation, each expected to remain in service for at least six years. 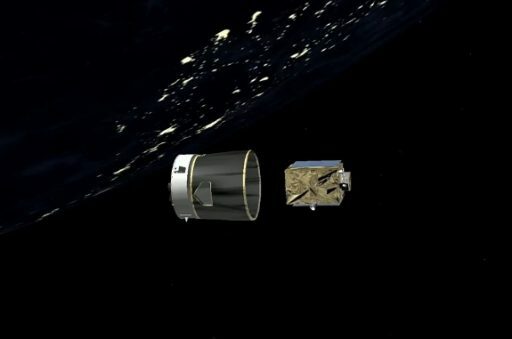 Having dropped off the four satellites, AVUM was set for a coelliptic orbit-raising operation starting 14 minutes after SkySat separation with a short burn of 46 seconds to raise the high point of the orbit to around 680 Kilometers. Next was half an orbit of coasting so that AVUM could fire its engine again at apogee to circularize the orbit via a 45-second burn. PeruSat-1 was targeting an orbit of 667 by 684 Kilometers, inclined 98.1 degrees, and was sent on its ten-year mission one hour and 43 minutes after liftoff. For AVUM, the fifth and final burn was coming 112 minutes into the mission when it was to perform a 15-second retrograde burn to drop out of orbit to dispose of itself via destructive re-entry. Thursday night’s mission was the seventh launch conducted by Arianespace in 2016. 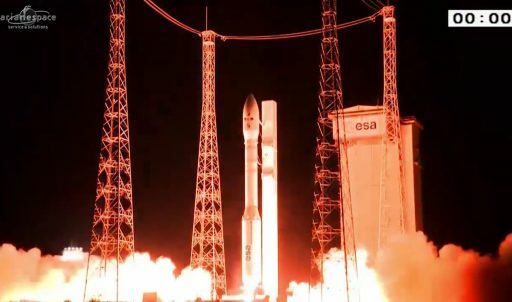 It was only the first Vega mission of the year, but the launcher can look forward to its busiest period to date, set to launch the Gokturk-1A satellite for Turkey before the end of the year and heading into a busy 2017 with at least three missions on the schedule, all headed to Sun Synchronous Orbits with Earth Observation or weather satellites. 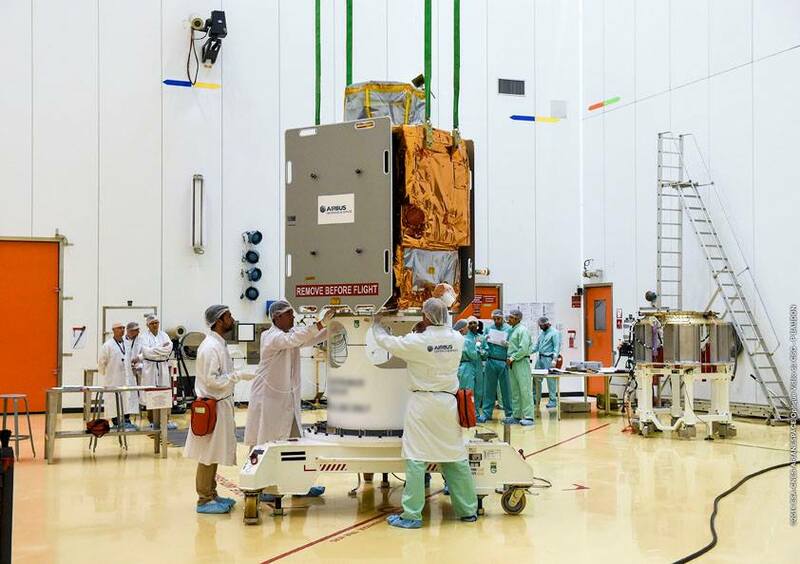 The next mission for Arianespace will come on October 4 when an Ariane 5 will lift GSAT-18 for India and the Sky Muster II satellite to deliver communications services to remote areas in Australia.